√ Perfect for Belaying AND Rappelling, Rock Climbing. √ Works Well With Double 8 mm Ropes Up to 16 mm Single Lines. √ LOW ACID PAINT: Environmental Blue Paint Never Gets Worn Off Easily. - If you are not happy with your buyer experiences at any point, simply let us know and we will issue you a refund or send you a brand new replacement with no hesitation. Your satisfaction today will be our motivation tomorrow. Thanks for giving DidaDi a chance to shine for you. ★[Surface Anodized Oxidation] - Not even a single chance for Rust & Corrosion during its whole life time, which certainly should be years to come under regular use. ★[For Use with Ropes From 8 to 16 mm] - Fits perfectly with double 8.1 mm ropes up to 13 mm single lines. Weight only 4.2 oz. 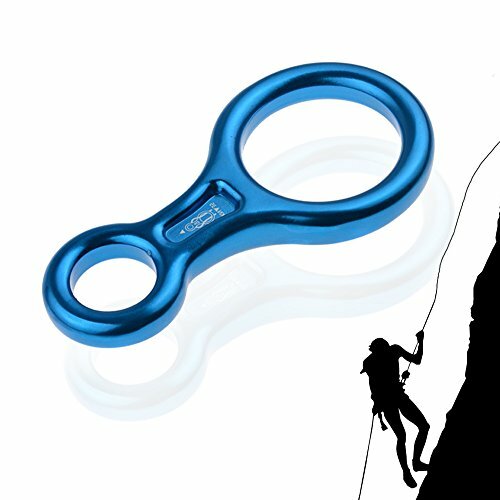 ★[Ideal for the Rock Climber or Search and Rescue professional] -Use Big hole to hold your main string and may use the Small hole with thin ropes if necessary, or as a belay plate. If you have any questions about this product by DiDaDi, contact us by completing and submitting the form below. If you are looking for a specif part number, please include it with your message.